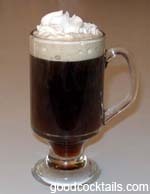 Pour the coffee liqueur and tequila into and Irish coffee mug. Fill it with coffee. Add whipped cream on top.